Bringing a unique revolutionary communist voice to the current discourse about god, atheism and morality, Avakian demystifies religious belief and examines how, even in its most progressive interpretations, religion stands in the way of the emancipation of humanity. A thread deeply woven throughout Away With All Gods! 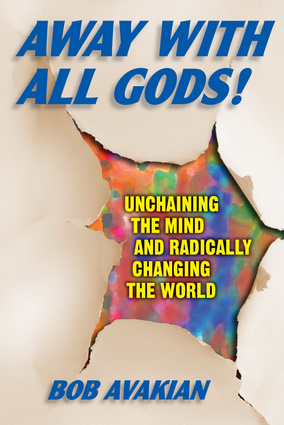 is the need to fully rupture with all forms of superstition, and to take up instead a truly scientific approach to understanding and transforming reality.Whether you believe in god, or are an agnostic or an atheist, Bob Avakian will challenge you with his powerful critique of long-established traditions and his liberating vision of a radically different world. Bob Avakian has been the Chairman of the Revolutionary Communist Party, USA, since its founding in 1975. A veteran of the revolutionary upsurges of the 1960s and early 1970s, he has spent the past several decades critically analyzing and evaluating the experiences of the first wave of socialist revolutions, in Russia and then in China—distinguishing their historic accomplishments from their shortcomings, and identifying the causes of their ultimate reversals. On this basis, and drawing from a broad range of human experience in many different fields, Avakian has brought forward what he characterizes as a new synthesis of communism—arguing provocatively for the necessity, the possibility, and the liberating potential of revolution in the U.S. itself, as part of a worldwide struggle for communism, enabling humanity as a whole to finally move beyond relations of exploitation and oppression, and the antagonistic conflicts to which they give rise.Bob Avakian's extensive body of work includes numerous books, other writings, and talks.